The main runway at Kahului Airport would be extended by about 1,500 feet to 8,530 feet to accommodate fully loaded aircraft with direct reach to the Midwest, according to an update of the Kahului Airport Master Plan. The update of the state Department of Transportation master plan, forecasts needed improvements to the main airport on Maui through 2035, and was completed in December, following consultations with federal and state aviation and transportation officials, users of the airport and the public. Prepared by R.M. Towill Corp., the plan lays the foundation for the preparation of a joint federal and state environmental impact statement for most of the first of three phases, which will take three years to prepare, according to state officials. Expansion and improvements to the terminal. 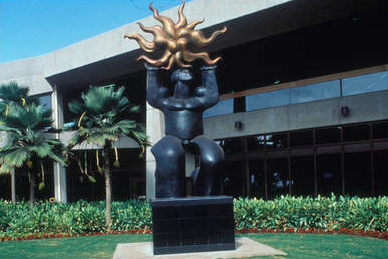 The plan also calls for moving Shige Yamada’s “Maui Releasing the Sun” statue, situated in 1992 in the area next to the TSA security area, to the baggage claim area where a skylight is located. Lengthening the runway would mean the closure of the “back road” of Haleakala Highway between Hana Highway and Keolani Place. Past efforts by the Transportation Department to close the road, which is seen by many of us as an alternative route in case of an accident blocking Hana Highway, have faced opposition. The closure is projected in Phase 2, to be completed between 2022 and 2030. Marvin Moniz, Maui District Airport Manager, said that he is working with transportation officials to keep the road open by building a tunnel. He’d like to save the road an keep it open. The winding road around the airport sits in the area of the main runway expansion and protection zone on the south side toward Hana Highway. The plan said that the 8,530 feet is the maximum runway length without having to redesign Hana Highway and to purchase more land, the plan said. Expanding to the north was not feasible because of “extensive land acquisition” required and the relocation of existing homes and the Kaunoa Senior Center. The runway extension, projected to cost $96 million and built by 2021, would allow planes such as the Boeing 737-800 and 777-200 to take off at maximum weight for cities such as Chicago, Dallas and Denver, the plan said. Currently, those flights have to take off with reduced fuel that requires a stop in Honolulu to refuel before heading to the Mainland. The main runway is in need of reconstruction, having been resurfaced five times since it was built in 1942. The last work involved an overlay project in 2006 at a cost of $3.4 million, the plan said. The runway currently is safe but the constant resurfacing instead of rebuilding has led to cracks and joint deterioration over the years that are generating debris that could damage aircraft, the plan said. This potential danger has made reconstruction of the runway — with a 20-year lifespan — a priority of the state Transportation Department and the Federal Aviation Administration. The projected cost for the runway reconstruction is $104.3 million. While the reconstruction work is ongoing — which could last up to 16 weeks — an existing apron taxiway east of the main runway could serve as a temporary runway, the plan said. Closing the main runway without an alternative was not a viable option given the loss of $8.4 million a day to Maui’s economy. There are no plans to extend the 4,990-long runway, which is mainly used by commuter airlines, the plan said. Although beyond its scope, the plan recommends building a new 7,000-foot-long, 150-foot-wide parallel runway. The runway would be located 2,500 feet east of the main runway on the Hana Highway side of the helicopter and general aviation facilities. It would have the same operational capabilities as runway 2-20 and serve as an alternative should the main runway be taken out of service, the plan said. The cost is projected at $768 million with acquisition of old Hawaiian Commercial & Sugar Co. cane land “an essential first step” for the runway, the plan said. The runway would be built beyond the 2035 scope of the plan. The terminal will need to be expanded to accommodate the increased number of passengers near the 2035 end of the planning period. The number of passengers from the Mainland is expected to grow from 2.9 million to 3.6 million by 2035. There currently are 13 aircraft parking positions — three for interisland and 10 for Mainland flights — in the terminal. The plan calls for leaving space on the south terminal area for expansion. The larger north terminal has nine aircraft parking spaces and 22 departure gates. With the relocation of cargo and car rental facilities to the new consolidated rental car facility currently under construction, there could be space for an additional exit to the baggage claim area, additional passenger holding rooms and parking areas for planes. North terminal expansion is constrained by the runway, relegating the area to aircraft parking and movement and airline operations, the plan said. New gates would be added to the south terminal. The south terminal has four aircraft parking positions, six holding areas and 16 gates. The holding areas are nearly half the size of those in the north terminal and would be tripled in size by plans to build over an interior roadway and connect with the terminal building on the other side. Some expansion work for the south terminal has been included in Gov. David Ige’s proposed biennium budget from July 1 to June 30, 2019. The governor has included $39 million in revenue bonds for hold room and gate improvements, said Transportation Department spokesman Tim Sakahara. Moniz explained that the money would be used to enclose the open walkways in the south terminal to enlarge passenger-holding areas and restrooms, widen gate areas and create a retail concession area. Airport officials also are studying the addition of one more jet bridge. As part of the larger expansion of the south terminal in the plan, air cargo and alien species inspection facilities will be relocated to lots on the south ramp. The next step is to prepare a joint federal and state environmental impact statement prior to applying for construction permits. The EIS, which will include most of the plan’s Phase 1, will focus on the main runway expansion and reconstruction, improving taxiways for the temporary runway, installation of navigational aids and lights, taxiway realignment, expansion of south terminal hold rooms, relocating the Maui statue, closing a portion of Haleakala Highway, and adding 500 spaces to cellphone/employee parking lots. The parking structure is near complete and we anxiously await the next phase. If this kind of growth doesn’t speak volumes for Maui’s development as a whole, I don’t know what will. It’s coming folks, and it’s an excellent time to be living and investing on Maui. If you’re curious, reach out, let’s talk. Year round sunsets and perfect weather, and a quality of life that is unsurpassable. I encourage you to ask questions, poke around and discover what a smart investment in the Hawaiian Islands can do for your financial portfolio and your peace of mind. Vacation rentals are what makes Maui appealing to the investors palette. Year round sun, means year round vacations. Purchase a family legacy to return to and build memories while generating a passive income stream at the same time. The Short Term Rental market starts at 400k and the sky is the limit for Maui’s most luxurious oceanfront developments. There are all kind of options for both South and West side locations at this price point. 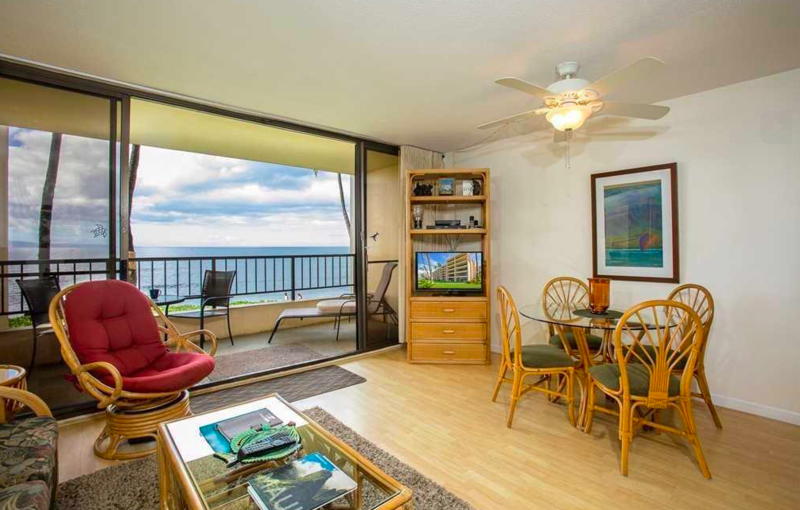 This week, my favorite opportunity is a 3 bedroom, 2 bathroom short term rental in Koa Resort, across the street from sandy beaches in Kihei, South Maui. This spacious unit has a functional floorpan in a low density and lush garden ambiance. Development amenities include tennis, pool, jacuzzi, and sauna. Smart investment recently listed at 629k. 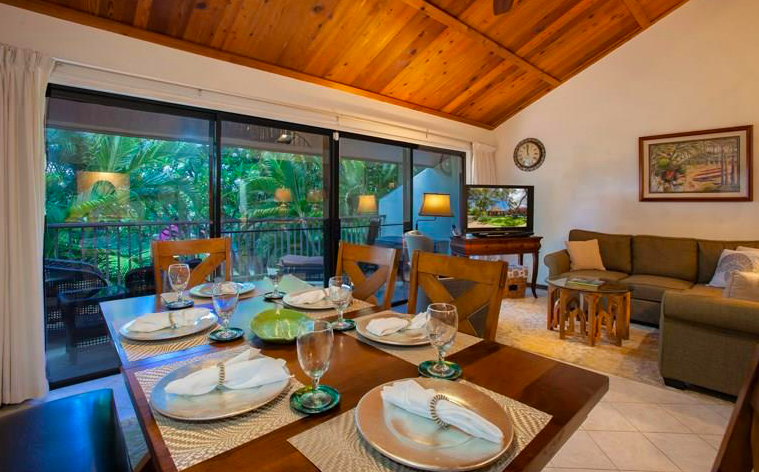 Absolute oceanfront from this 1 bedroom, 1 bathroom short term vacation rental at Sugar Beach Resort. A clean and bright unit with granite in kitchen and bath. Year round sunsets and whale watching in the winters from this make this short term rental an absolute no-brainer – it will rent like clock work year-round. If this one sparks interest, act fast. Oceanfront at this price point doesn’t last long. Just listed at 699k. 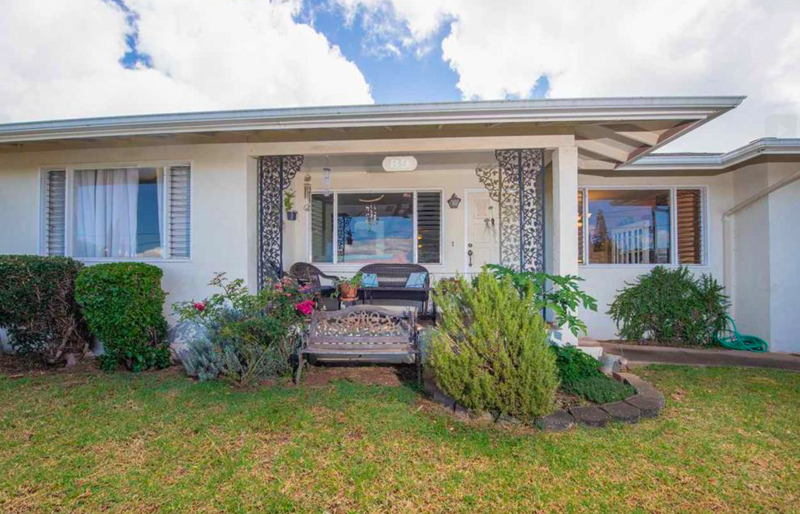 A charming fixer with good bones and a great floor plan in Maui’s Makawao Ranch Acres. This home has a large lanai with 3 bedrooms and 3 baths and 1900 sq. ft. of living space. Tucked on the hillsides of majestic Haleakala Crater for cooler climates and fresh trade wind breezes. Enjoy brisk weekend mornings at the Kula farmers market, and be conveniently located near Maui’s most coveted private schools. This spacious 12,000 sq. foot lot is a smart investment and provides enough room to settle in and settle down in a charming upcountry location. Newly listed at 665k. A 14,500 square foot vacant lot ready to build. Wonderfully located cross the street from multi-million dollar homes and the most epic sandy beaches. 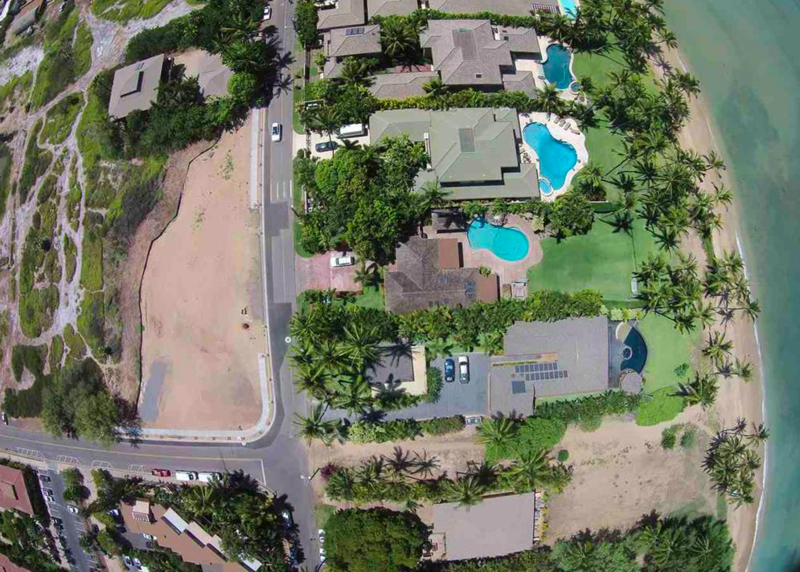 Halama Street is known for it’s oceanfront estates and extreme accessibility. Stand-up paddle, fish and enjoy year round sunsets in a highly desired South Maui location. At approx 1/3 acre and zoned R-3, this flat, rectangular 142’ X 101’ lot is in a new subdivision. Water meters, road improvements, curbs and walks are all in and ready. Bring your imagination and lets put paradise in your portfolio. If you’ve thought of making an investment in a place of rapid growth and endless appeal, I’d love to talk to you about the best opportunities available on Maui. I’m happy to share all about my relocation from Los Angeles in my early 30’s – and how amazing it feels to never look back. The priorities shift when buying on Maui – you start to feel and share the aloha.